Can Human-Inspired Learning Behaviour Facilitate Human–Robot Interaction? The evolution of production systems for smart factories foresees a tight relation between human operators and robots. Specifically, when robot task reconfiguration is needed, the operator must be provided with an easy and intuitive way to do it. A useful tool for robot task reconfiguration is Programming by Demonstration (PbD). PbD allows human operators to teach a robot new tasks by showing it a number of examples. The article presents two studies investigating the role of the robot in PbD. 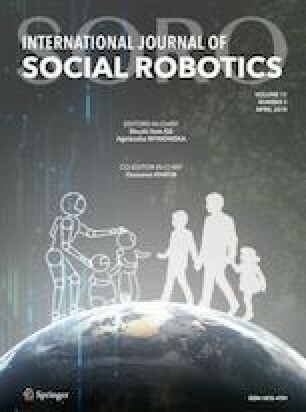 A preliminary study compares standard PbD with human–human teaching and suggests that a collaborative robot should actively participate in the teaching process as human practitioners typically do. The main study uses a wizard of oz approach to determine the effects of having a robot actively participating in the teaching process, specifically by controlling the end-effector. The results suggest that active behaviour inspired by humans can lead to a more intuitive PbD. The authors would like to thank the teachers and students of the vocational education and training schools “Centro Oratorio Votivo, Casa di Carità, Arti e Mestieri, Ovada” and “Istituto Tecnico Industriale Statale Italo Calvino, Genova” for their contribution to the drafting and execution of the experiments. This work has been supported by the European Union Erasmus+ Programme via the Master programme European Master on Advanced Robotics Plus (EMARO+).